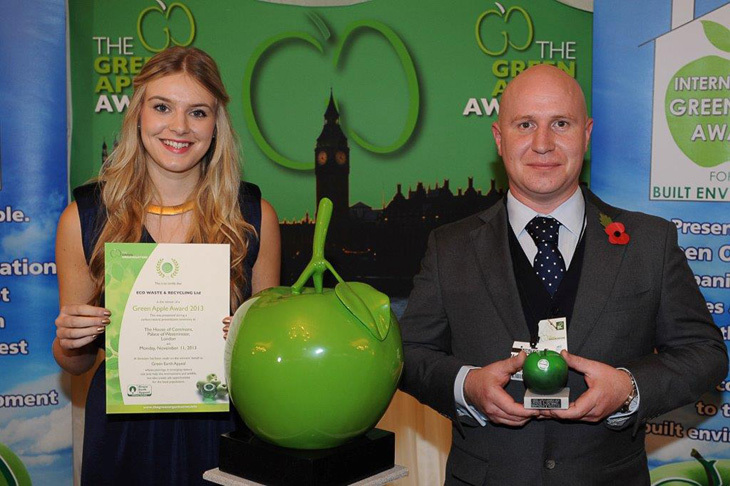 On the 11th November at the Houses of Parliament Eco Waste and Recycling was awarded the UK Silver Winner in the Science and Technology Sector at the Green Apple Awards 2013! In 2012 Eco Waste reached the finals of the Archant Herts & Cambs Green Awards, and through this received a nomination for The Green Apple Awards which is a national competition. Eco Waste and Recycling excelled on the night, achieving the silver award for Science and Technology. Adam Wake, the director of Eco Waste, attended the ceremony and was presented the award by Miss Green UK (pictured). The Green Apple Awards are presented annually in recognition of companies, councils and communities carrying out projects that strengthen the environment and there were more than 500 nominations this year overall; so to get this prestigious award Eco Waste have really succeeded!